People are welcome to attend and air any further views they may have. That will be the last chance to do this before North Somerset determine the application on Wednesday 13 August at their meeting which starts at 4.00pm in the Town Hall. This meeting is open to the public but only one person is allowed to address the Planning Committee in support of the application and one opposing it. North Somerset must be advised of who's doing this before the meeting - contact details on their website. An application has now been submitted click here to see it on North Somerset website if you previously made comments to the presentation evening and are still concerned then you should make your views known again as part of the formal application process. 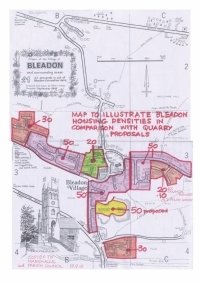 This is a major new development for Bleadon and will affect it's future in many ways so please take the time to read the documents provided and comment accordingly. I have now obtained a copy of Marshalls Quarry Final Presentation (PDF) boards displayed at the Youth Club on 27th November 2013. So please click on the links to see them and/or download and make comment if you wish. If you have any problems viewing them please let me know. As stated in conclusion on Board 6 "Marshalls’intention now is to submit an Outline Planning Application to North Somerset Council within the next three months. Comments received prior to submission will be recorded and shared with your Parish Council and North Somerset Council. As we have endeavoured to do throughout this process, we will incorporate your suggestions wherever possible within a viable solution. We trust that you will see that our revised proposals have been informed by your comments and changes have been made wherever possible". As stated in Bleadon Village News, another meeting is scheduled for 27th November 2013 (2 sessions 10.30am-1pm & 5pm-7pm) at the same Bleadon Youth Club location. Please make every effort to attend and see the comments made following Septembers meetings and Marshalls subsequent final proposal for planning permission. For comparison purposes, you may be interested to look at the results of the 2005 Parish Plan Questionnaire that has a section on Housing. 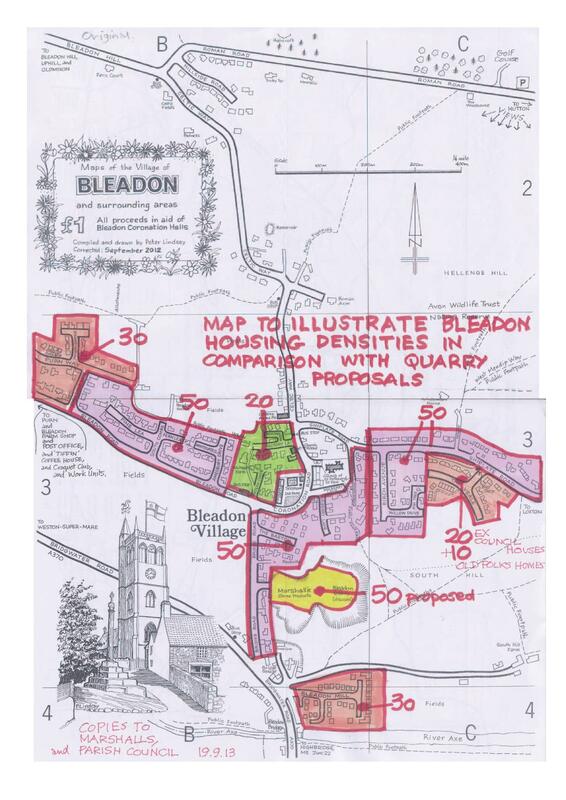 Also here is an interesting illustrative map created and kindly shared as part of a submission to the Quarry consultation process that shows the relative housing densities of areas within Bleadon compared to the Quarry proposals. 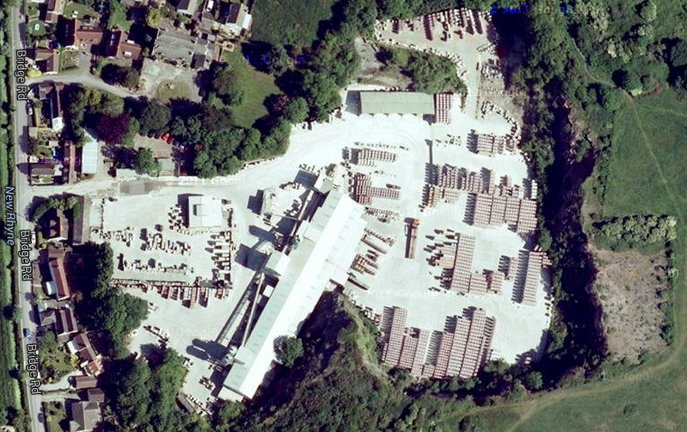 Marshalls have now supplied me their Quarry Presentation (PDF) and Feedback form (PDF) as displayed at the meetings. So please click on the links to see them and/or download and make comment if you wish. If you have any problems viewing them please let me know. We would obviously like to pass on our thanks to those who were able to attend and make comments and, at the same time, encourage those that didn’t/couldn’t to give some consideration to our proposals and tell us what they think so that we can try and address any issues and improve our Outline scheme in time for the second and final event which we have undertaken to host sometime in November. Please note that it is our intention to host a one day event at the Youth Centre, albeit with shorter sessions - perhaps a two hour lunchtime slot and a two hour teatime slot each day. Further details will follow in due course." 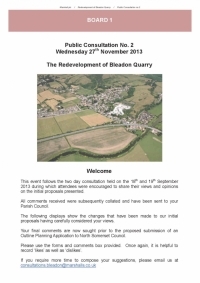 As you may have seen advertised in the Bleadon Village News (Summer 2013), there are presentation meetings arranged for consultation about proposals that will lead to a future planning application for re-development of the quarry. Marshalls' presentation meetings are in Bleadon Youth Centre (Coronation Halls area) and there is a choice of day and session for you to attend, Wednesday 18th or Thursday 19th September (10am-2pm & 5pm-7.30pm on both days). It is a very large site and could have huge implications for the character and size of the village, including a loss of employment. 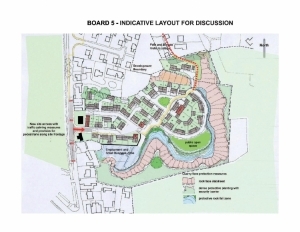 Marshalls will need community approval for their plans especially if they wish to exceed the provisional 25 houses and may look for a much larger development with the approval of the community in exchange for some community facilities. A properly thought out and designed mixed use development on this brownfield site could well be an asset to the village. It is essential that as many people as possible attend, view the proposals and share their thoughts and opinions with Marshalls' representatives at the consultation, members of the Parish Council and in writing to Marshalls and the Parish Council. Previous comments on the Quarry site that were submitted to North Somerset as part of their Sites & Policies (Development Plan) Consultation, can still be viewed via this previous blog and directly ( by searching for comments containing Marshalls Quarry Bleadon here) and these comments should also be submitted again to Marshalls and the Parish Council as part of this presentation/consultation process. You may also be interested in this Marketing Review Document produced for Marshalls and posted with their comments on the North Somerset Sites & Policies consultation by their agents RR Planning Ltd and previous correspondence to North Somerset Planning on Core Strategy for the site. this location due to the proximity of neighbouring properties. &middot; B8 Storage or distribution - This class includes open air storage. with the main entrance to the site. &quot;It has to be visible from Bridge Road&quot;.